To Cite: Kalidari B, Mahmoudieh M, Melali H, Nazari Moghadam M, Kolahdouzan M. Predictive Factors of Steatosis and Non-Alcoholic Steatohepatitis in Morbidly Obese Patients Undergoing Bariatric Surgery, Hepat Mon. 2017 ; 17(11):e14088. doi: 10.5812/hepatmon.14088. Background and Objectives: Obesity is one of the most health-threatening phenomena. It is estimated that over 1 billion adults have overweight or obesity. 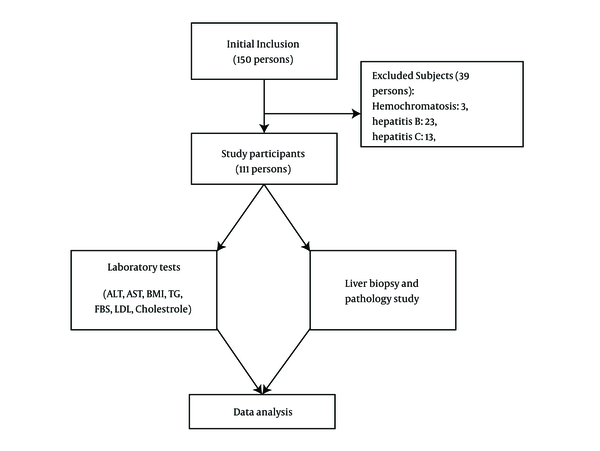 The current study aimed at presenting a detailed account of the findings that attempted to predict the severity of fatty liver disease and its sequelae, including non-alcoholic steatohepatitis (NASH), fibrosis, and cirrhosis, by correlating biopsy results with liver function tests and various metabolic markers of laboratory results in patients with morbid obesity. Methods: A total of 111 subjects participated in the study. The collected data included pathology study of liver biopsy, fasting blood glucose (FBS), liver function test (LFT), and lipid profile. Results: The correlation between fibrosis and steatosis was 0.493 (P = 0.001, 95% confidence interval (CI) and correlation between fibrosis and NASH grade was 0.531 (P = 0.001, 95%CI). There was a significant relationship between aspartate aminotransferase (AST) and triglyceride (TG) with steatosis intensity and a significant positive relationship between AST, cholesterol, and FBS with NASH intensity. Conclusions: Levels of serum AST and TG showed significant relationship with steatosis and fibrosis intensities; AST, FBS, and cholesterol had a significant correlation with NASH intensity. Cholesterol and low-density lipoprotein (LDL) levels had an inverse monotonic relationship with fibrosis intensity. Obesity is one of the most health-threatening phenomena. It is estimated that over 1 billion adults have overweight or obesity (1). Obesity (body mass index (BMI) > 30 kg/m2) or morbid obesity (BMI > 40 or 35 kg/m2 with complications) affect normal function of different systems of the body such as cardiovascular, respiratory, and endovascular systems (2, 3). Obesity is correlated with metabolic syndrome (a syndrome known with trunk obesity, high triglyceride level, decrease in high-density lipoprotein (HDL), hypertension, and hyperglycemia) and its liver complication; i e, non-alcoholic fatty liver disease (NAFLD) (1). Fatty liver includes a range of different liver diseases, from simple steatosis to steatohepatitis. Steatosis is a benign condition in which more than 5% of liver weight is accumulated with fat in hepatocytes. If this aggregation is coexistent with necrotizing changes and inflammation, it is called non-alcoholic steatohepatitis (NASH). NASH progression could turn into cirrhosis or hepatocellular carcinoma (1, 4-7). The prevalence of NAFLD in adults is 24% (8) and in people with obesity 74% to 92% (1, 8-14). NASH prevalence in normal population is 10% to 20% and in people with severe obesity is almost 37% (15). Clinically differentiating NASH from simple steatosis is nearly impossible. NASH and NAFLD are commonly asymptomatic when the disease is not in advanced grades (8). Treatment and diagnosis of NASH in early stages are of high importance because NASH is potentially fatal. It is necessary to survey with different paraclinical and radiological methods when there is a strong clinical suspicion of NAFLD, after ruling out other liver diseases. Due to the fact that radiological methods could not differentiate NAFLD from NASH, liver biopsy is recommended in high risk patients (1). Liver biopsy could recognize the etiology and grading of the liver disease. There are some supportive therapies based on weight loss and metabolic adjustment. One of the most effective and permanent methods for weight loss is bariatric surgery. Recent studies revealed some improvements in steatosis, inflammation, and liver fibrosis after bariatric surgery, but its efficiency for fatty liver and metabolic disorders was not proven so far (16-24). In contrast to several studies in this matter, there is a lack of a serum marker, which could be a decent predictive of NAFLD or the severity of NASH disease. The current study aimed at presenting a detailed account of the findings that attempted to predict the severity of fatty liver disease and its sequelae including NASH, fibrosis, cirrhosis, by correlating biopsy results with liver function tests and various metabolic markers of laboratory results. A total of 111 patients with morbid obesity (BMI > 40 or 35 kg/m2 with complications) who underwent laparoscopic Roux-en-Y gastric bypass surgery (LRYGBP) in Isfahan Al-Zahra Hospital, Iran, from 2013 to 2014 were included in the current clinical trial (ethical committee approval number: 394129). Appropriate sample size to estimate the mean was 150 persons. Subjects were consecutively selected and participated in the study. Successively, patients with conditions such as hemochromatosis, the Wilson disease, liver autoimmune disease, type B and C viral hepatitis infections, or other chronic liver disorders were excluded, and finally 111 subjects participated in the current study (Figure 1). The collected data included pathology study of liver biopsy, fasting blood glucose (FBS), liver function test (LFT), and lipid profile. One type of gastric bypass surgery is a Roux-en-Y gastric bypass. In a Roux-en-Y gastric bypass, only a small part of the stomach is used to create a new stomach pouch, roughly the size of an egg. The smaller stomach is connected directly to the middle portion of the small intestine (jejunum), bypassing the rest of the stomach, and the upper portion of the small intestine (duodenum). This procedure is performed by making several small incisions and using small instruments and a camera to guide the surgery (laparoscopic approach). This surgery seems to be effective with a low relapse rate (20). Liver function test, fasting blood glucose, and lipid profile of patients were gathered before bariatric surgery and a liver wedge biopsy was performed at the end of the surgery and specimens were saved in formalin solution. No gas inhalation was performed for anesthesia and no retractor was used on the liver during the surgery. All samples were evaluated by 2 blinded hepathopathologists to indicate the level of steatosis, NASH, and fibrosis. Also, NAFLD was diagnosed based on evidence of fatty liver upon sonography and excluding other etiologies. Liver biopsies were handed to 2 pathologists in the pathology department; both were blinded to the details of the research. Samples were stained by hematoxylin and eosin, periodic acid-schiff, the Masson trichrome, and reticulin. Steatosis was measured by percentage of the hepatocytes accumulated with fat, and NASH intensity was evaluated considering inflammation pattern and its scope. The Brunt grading system was employed. In this system steatosis was divided into 4 groups: normal, mild, moderate, and severe. NASH was graded as steatosis, considering lobular inflammation, ballooning degeneration and perisinusoidal fibrosis. NASH was also divided into 4 groups: normal, mild, moderate, and severe. The current study assessed the incidence and relationship between the findings of pathology and liver function test, lipid profile, and gender. Data analysis was performed with SPSS version 16.0 by the independent t test, chi-square test, and the Spearman heat map. Among 111 patients with morbid obesity in the current study, 76 were female and 35 male with the mean age of 36 ± 11years and average BMI of 43.01 kg/m2 who underwent laparoscopic Roux-en-Y gastric bypass surgery (LRYGBP) from 2013 to 2014 in Al-Zahra Hospital, Isfahan, Iran. Two-way frequency tables of the observed steatosis, NASH, and fibrosis grades were presented as contingency Tables 1- 3. In Table 1, the incidence frequency of steatosis grades against NASH grades of the patients is illustrated; in 94 of 111 patients (85%) steatosis is associated with NASH. The Spearman correlation between steatosis and NASH grade was 0.84 (P = 0.001, 95%CI), which showed a highly significant relationship between steatosis and NASH grades. Based on this observation, it can be inferred that patients with a higher degree of steatosis were prone to higher degrees of NASH. Tables 2 and 3 represent patients’ fibrosis grades on the basis of steatosis and NASH grades, respectively. Among the 111 patients, only 2 patients were labeled with severe fibrosis. There was a weak, but significant relationship between steatosis and NASH grades with fibrosis grade. The Spearman correlation between fibrosis and steatosis was 0.493 (P = 0.001, 95%CI) and that of fibrosis and NASH grade 0.531 (P = 0.001, 95%CI). The candidates to predict steatosis, NASH, and fibrosis intensity included the following markers: alanine aminotransferas (ALT), aspartate aminotransferase (AST), BMI, triglyceride (TG), FBS, low-density lipoprotein (LDL), cholesterol, and HDL. The values of these markers were missing for those 2 patients with severe fibrosis. Variability of these markers by different levels of steatosis, NASH, and fibrosis intensities is illustrated in Figure 2 using box plots. In Figure 2, the scales of selected markers were normalized based on mean and standard deviation (SD) for a better fit in vertical axis; therefore, all variables have a mean of 0 and SD of 1. The exact mean and SD of these markers are given in Table 4. Abbreviations: ALT, aspartate aminotransferase; AST, alanine aminotransferase; BMI, body mass index; Col, cholestrole; FBS, fasting blood sugar; HDL, high-sensity lipoprotein; LDL, low-sensity lipoprotein; NASH, none-alcoholic steatohepatitis; TG, TriGlyceride. As it can be observed in Figure 2, there was a monotonic relationship between AST and ALT with steatosis, NASH, and fibrosis intensity in a manner that the intensity level of these fatty liver disorders increased monotonically as each of these markers increased. A monotonic relationship between FBS and NASH intensity was also inferred from the middle row of Figure 2. 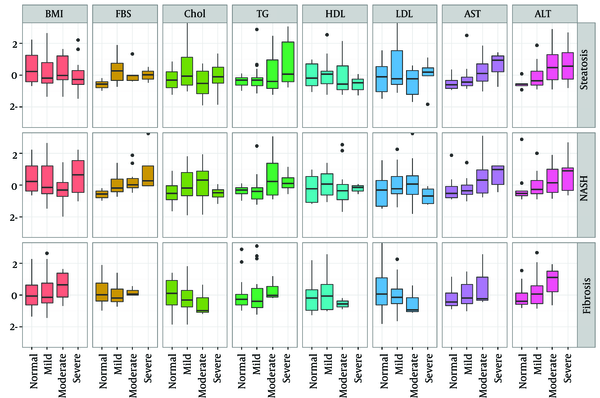 A monotonic inverse relationship between cholesterol and LDL, and fibrosis intensity can be observed from the bottom row of Figure 2. *Significant at the level of 0.05; 95%CI; ** Significant at the level of 0.01; 99%CI. Due to a strong collinearity between the selected markers, the variance of estimated effects was inflated in a full model with all markers involved as covariates, which may cause effective markers to come out insignificant; however, they might be really significant. Figure 2 illustrates the pairwise Pearson correlation of the selected markers. As it can be observed in Figure 2, there was a significant relationship between AST and ALT and also between LDL and cholesterol. To avoid co-linearity and variance inflation problem, the current study used a stepwise model selection strategy to search for a proper prediction model. As it can be observed, there was a significant positive relationship between AST and TG with steatosis intensity. Also, based on the current study findings, there was a significant positive relationship between AST, cholesterol, FBS, and NASH intensity. In the current study, 85% of the subjects were associated with NASH reported more scarcely in previous studies (14, 25-28). This difference of prevalence is discussed further. The current study concluded that a significant relationship existed between the levels of serum AST and TG with steatosis and fibrosis grades. 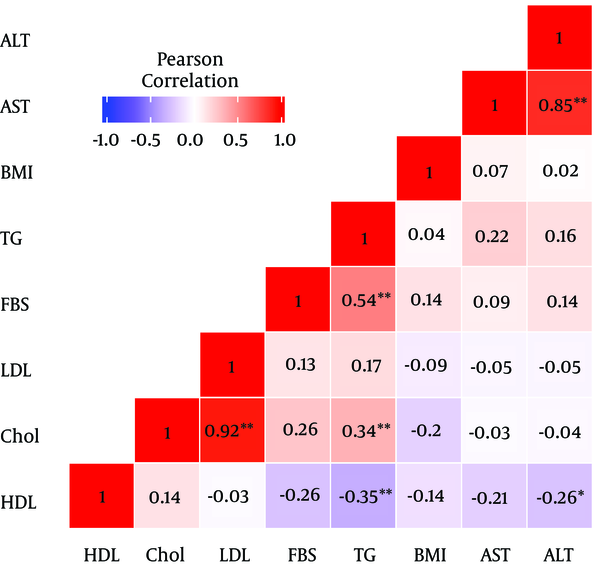 Moreover, AST, FBS, and cholesterol had significant correlation with NASH grades. In addition, in accordance to the current study findings, age, HDL, and BMI had no significant relationship with the severity of pathological liver problems. Based on several previous studies, the prevalence of NASH in patients with morbid obesity was revealed in a remarkably wide range (2.6% to 91%) (29). Feijo et al. evaluated the prevalence of NAFLD and NASH in patients with morbid obesity undergoing bariatric surgery and identified the risk factors associated with the disease spectrum. They concluded that NAFLD seemed to be an obesity-related condition and approximately half of the asymptomatic patients with morbid obesity had histological characteristics of NASH (30). According to Helling et al. only the increased TG levels and decreased pre-albumin correlated with NASH (31). In addition, Younossil et al. also developed a reliable NASH-related fibrosis model, which indicated that the clinical and biological characteristics such as diabetes, gender, BMI, and TG were significantly correlated with the disease (32). Morita et al. studied the prevalence of steatohepatitis and its predictive markers in patients with obesity undergoing bariatric surgery. They concluded that age, waist circumference, serum ALT and TG levels were the efficient non-invasive predictive markers to diagnose and manage steatohepatitis in patients with morbid obesity (33). There are various predicting or alarming factors for NASH in accordance to several studies. Based on a similarly designed study, male gender and AST were independently associated with NASH and advanced fibrosis (34). Also, disturbed liver function test results had significant association with NASH in several studies (35-37). Uslusoy et al. found no relationship between NASH and BMI (38). Although there was a massive amount of literature supporting the current study findings one by one, good amount of literature with contrastive inferences can be observed, suggesting a debate on this issue. Park et al., aimed at studying and identifying factors associated with pathological grading of NAFLD. They believed that BMI was a unique factor directly related to both the severity of fibrosis and the presence of NASH (39). In addition, Shi et al. noted that the elevated serum levels of ALT were a dependent predictor of steatosis and fibrosis (40). In contrast to the current study results, recent studies expressed that ALT and AST were not reliable markers for NASH or fibrosis (41). Moreover, Uslusoy et al. found no relationship between ALT and AST levels, and liver fibrosis (38). In the study by Gholam et al. it is observed that except for BMI and hyperglycemia, insulin resistance and the metabolic syndrome were associated with the presence of NASH and fibrosis (42). Moreover, the current study found a strong positive correlation between AST and ALT (0.85). Since, as mentioned earlier in this section, ALT levels had a significant relationship with NASH in some studies, and the current study suggested an insignificant relationship between ALT and the diseases (even morbid obesity), further studies on this condition and its relationship with ALT levels are recommended to ensure if ALT is related. Also, there was a strong correlation between LDL and cholesterol levels (0.92), which could introduce LDL as a predictor for NASH in the future studies. Limitations of the study: Due to ethical issues some patients refused to consent for a second biopsy after Roux-en-Y practice; hence, there was no patient follow-up to evaluate the effects of this surgery or the other procedure, since no biopsy was performed, while doing any other surgeries. Therefore, close follow-ups of different bariatric surgery outcomes on NASH and steatosis, as well as their comparison are recommended. The current study findings revealed that the levels of serum AST and TG had a significant relationship with steatosis and fibrosis intensities; AST, FBS, and cholesterol had a significant correlation with NASH intensity. Moreover, as indicated in Figure 3, cholesterol and LDL levels had an inverse monotonic relationship with fibrosis intensity. This also may be considered as a topic of future studies. Age, HDL, and BMI had no significant relationship with the severity of liver pathologies; a finding that was rather strange and considered as a limitation in the current study. It is believed that some factors such as waist circumference and other parameters of metabolic syndrome might need to be evaluated in further studies. The authors gratefully appreciate the help of Isfahan University of Medical Sciences, Isfahan, Iran. Disclosures: Authors declared no financial ties to disclose. Conflict of Interest: No potential conflicts of interest were disclosed. Ethical Approval: All procedures performed in the study involving human participants were in accordance with the ethical standards of the institutional, and/or national research committee, and the 1964 Helsinki declaration and its later amendments or comparable ethical standards.